TypeScript application wants tests to be written in TypeScript as well, right? But how to debug such tests within your IntelliJ IDE? I'm developing under Windows, but for Mac or Linux would be the situation almost the same. Working directory is the location of my TypeScript project, generally it the directory where your Jasmine configuration is located. Application parameters are used to debug a concrete test suite. If you want to debug all the Jasmine tests, leave this field empty. 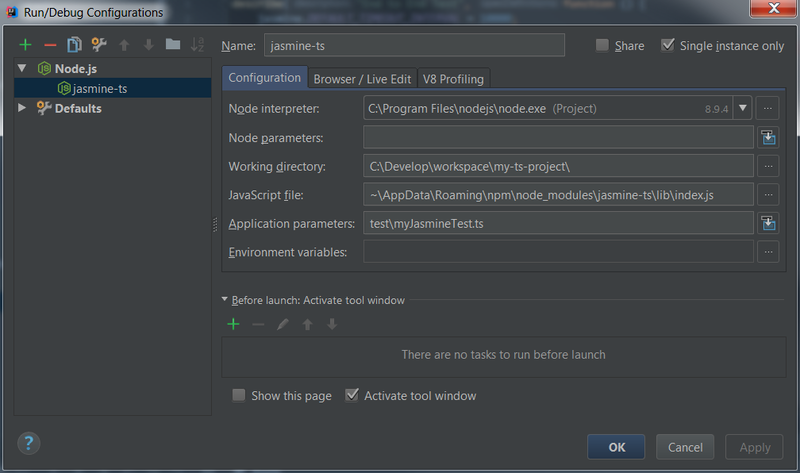 In my case, all my Jasmine test files are located under the test sub-folder in my project directory. Then just set up some breakpoints and click the Run/Debug button.